Step 1:Put 4pcs AAA batteries in(not included) or plug the USB cable tightly in the USB port. Step 2:First, please touch the sensor switch ( the big circle) with your finger, the mirror will light up. Step 3:Secondly, please touch the sensor switch for several seconds, which will change brightness of the light gradually. Release your finger till the brightness of the light is right for you. 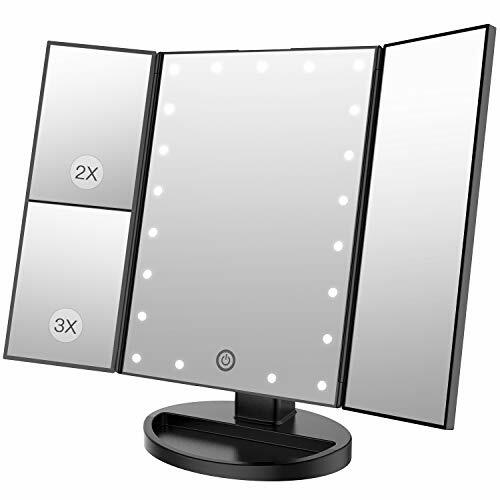 Mirror can not store power itself..
21 PIECES LED LIGHT: Our Vanity mirror is built-in 21 pieces adjustable Leds,allow you makeup in the dark or poorly lit areas.LED lights brightness adjust by the touch sensor switch. DOUBLE POWER SUPPLY: This Led mirror can either operated by 4 pcs AAA batteries (not included) or USB cable (usb wire included)to make it work,mirror can not store power itself. If you have any questions about this product by BESTOPE, contact us by completing and submitting the form below. If you are looking for a specif part number, please include it with your message.